Georgia's household chemistry market heavily relies on import -- mostly from Russia, Turkey and Iran. The local manufacturers are only just making the first steps in this direction. Most of them are trying to give a "foreign" look to their products, since the majority of Georgian consumers do not quite trust the local chemistry goods yet. I designed my first detergent label in 2006. It was named 100+1 and came in three different flavors (you can see the "green apple" version on the right). The brand name was a clever invention for the local market: at that time the label designation rules strictly required the main titles to be in Georgian (which was something highly undesirable for the household chemistry manufacturers), and the name 100+1 consisted only of numbers, which conveniently avoided using a Georgian title, while breaking no rules. But not all the manufacturers were so clever. Some of them went on a shady path of disguising their products as foreign. The next order, which I received the same year, was precisely of this sort: I was required to make a bilingual label with primary designations in German and secondary in Russian, to mislead the customer into believing it was an original German product exported to Russia. Naturally, I protested with all my might, but my three wives and eleven children (numbers are slightly exaggerated for a dramatic effect) were starving to death, so I took my thirty pieces of silver and set to work. The labels were called DamlaX (which is quite strange for a "German" product, since "damla" is a Turkish word, meaning "drop of water") and also came in three versions -- only this time divided not merely by flavors, but different scopes of application (glass, dishware, universal). Also, there was a small label for liquid soap. That's when my first "detergent character" was born -- a cute girl with a big smile and even bigger frying pan, ready to be used as a tennis rocket with someone's head as the ball, if that someone tries to offend her (by refusing to buy the product, that is). The "Damla-Girl" soon was followed by another character -- a mole, designed for a caustic soda label. Why mole? 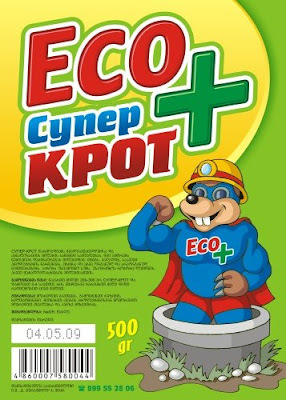 It's a long story, but to be short, there is an insanely popular Russian brand of caustic soda, named KROT (meaning "mole" in Russian), which uses a mole as its symbol. 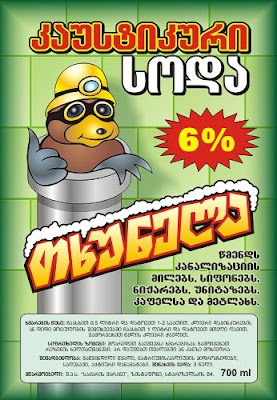 Traditionally, the mole is depicted wearing goggles and a miner's helmet, often climbing out of a pipe (since caustic soda is mainly used to cleanse pipes). This time the clients were strictly law-obedient: it was clearly a local product, with proper Georgian title and inscriptions. Last year was very productive in regard of household chemistry labels -- I received a whole series of orders from a newly emerged private manufacturer. 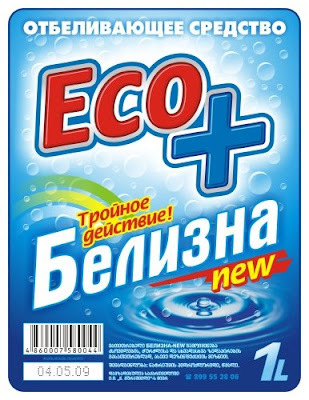 The first labels, going under the brand name UNIVERSAL+, were bilingual (Georgian-English), but the next series, named ECO+, dropped Georgian titles entirely, because by that time the designation rules had been somewhat softened, allowing to disregard Georgian, leaving it mandatory only in technical data -- such as usage, ingredients, validity terms, etc. Soon after that I received a similar order from a different manufacturer. This time I had to invent the brand name myself, since the clients had no idea what to call their product. It proved to be quite a challenge, since all the good names had been already snatched away. I finally came up with SHINY, but it took quite an effort to convince the clients to use this name, because they had some reservations about the ability of an average local consumer to pronounce the English word properly. Anyway, the labels were done, and another character was born: a shiny, smiley and toothy drop with energetic thumbs up. 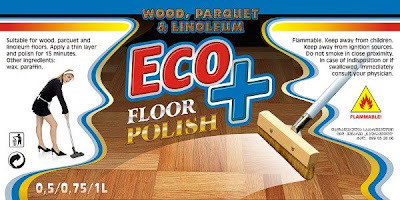 Then I returned to ECO+ brand, only this time with slightly different products: floor polish and glass cleaner. It was an entirely unexplored territory for me and I really enjoyed the work. In both labels I used the "wiping" effect, but achieved it differently in each case: in floor polish it was a simple gradient transparency, while in glass cleaner I used a more elaborate method, working with layers and filters to get the "wiped window" effect. By the end of 2008 we gathered quite a bunch of ECO+ products. Below you can see them in all their glory -- actual containers with actual printed labels, exactly as they appear on supermarket shelves. But the big wash wasn't over yet. This year I received several new orders from this manufacturer. The first was two series of liquid soap labels: one for transparent plastic bottles and another for semi-transparent plastic canisters. 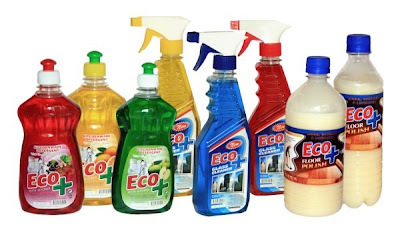 It was done in the "classic" manner of ECO+ detergents, already tried and tested in battle. The second on the menu was a multipurpose whitener called Belizna -- another popular Russian brand (the word means "whiteness" in Russian). It was quite easy: a snow-white title against blue background (a winning combination), a little splash, some yummy bubbles... and done! Then things got more interesting, because the next label required the creation of a new "detergent character" -- something like my Damla-Girl, only less headstrong. But before that, I needed a hand... literally. 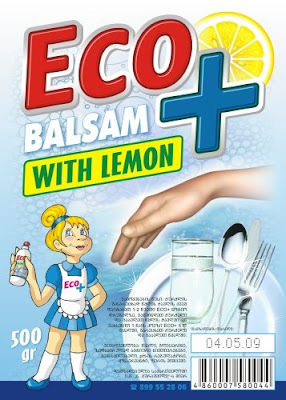 The client insisted that there had to be a hand image on the label, because it was a sort of "detergent balsam" with some protective additions for hands (glycerol, to be precise). Naturally, the hand should have been that of a female. I didn't have any suitable hands at my disposal, so I had to involve Diana, my ever-ready lifesaver, asking her to take some photos of her left hand and send them to me ASAP. After some trial and error, I received my hand, which was quite well-preserved, but still required a little "manicuring." I added some extra "glamour" with Portraiture Plugin for Photoshop and reversed the image, because I needed a right hand for my label, not a left one. The hand fitted just perfectly, and now I switched to drawing the new character. Like in previous cases, first I drew the line art by hand, then I scanned it into the computer, traced it and finished in my graphics editor. The "Eco-Girl" came out a lot more likeable than her predecessor -- I really got my hand in making these cartoonish characters in the past few years. I added a slice of lemon and the work was done. The new mole had the same helmet and goggles, and he also climbed out of the pipe, as you would expect from a mole of his profession, but this time... dressed in Superman costume (with ECO+ logo instead of the letter "S") and flexing a well-developed biceps. That's the end of the big wash... for now. Hopefully, there will be more washing and cleansing in the future, because I find the process of designing household labels rather... refreshing.